This article is about the NASA crewed spacecraft. For other uses of the term, see Orion (disambiguation). The Orion Multi-Purpose Crew Vehicle (Orion MPCV) is an American-European interplanetary spacecraft intended to carry a crew of four astronauts to destinations at or beyond low Earth orbit (LEO). Currently under development by the National Aeronautics and Space Administration (NASA) and the European Space Agency (ESA) for launch on the Space Launch System, Orion is intended to facilitate human exploration of the Moon, asteroids and of Mars and to retrieve crew or supplies from the International Space Station if needed. The Orion MPCV was announced by NASA on May 24, 2011, and is currently under development. Its design is based on the Orion Crew Exploration Vehicle from the cancelled Constellation program. It has two main modules. The Orion command module is being built by Lockheed Martin at the Michoud Assembly Facility in New Orleans. The Orion service module, provided by the European Space Agency, is being built by Airbus Defence and Space. The MPCV's first test flight (uncrewed), known as Exploration Flight Test 1 (EFT-1), was launched atop a Delta IV Heavy rocket on December 5, 2014, on a flight lasting 4 hours and 24 minutes, landing at its target in the Pacific Ocean at 10:29 Central (delayed from the prior day due to technical and weather problems). The first mission to carry astronauts is not expected to take place until 2023 at the earliest, although NASA officials have said that their staff is working toward an "aggressive internal goal" of 2021. However, a July 2016 Government Accountability Office report cast doubt on even the 2023 launch date, suggesting it may slip up to six months. The report gave only a 40% confidence in the 2021 launch date, and suggested the aggressive goal may be counterproductive to the program. For fiscal years 2006 through 2018, the Orion program had expended funding totaling $15,983 million in nominal dollars. This is equivalent to $18,138 million adjusting to 2018 dollars using the NASA New Start Inflation Indices. Costs "for production, operations, or sustainment of additional crew capsules, despite plans to use and possibly enhance this capsule after 2021"
For 2019 to 2023, NASA "notional" yearly budgets for Orion range from $1.1 to $1.2 billion. As of late 2015, the Orion program has a 70% confidence level for its “first Orion mission with astronauts by 2023” according to the Associate Administrator for NASA, Robert Lightfoot. Orion CEV design as of 2009. On January 14, 2004, U.S. President George W. Bush announced the Crew Exploration Vehicle (CEV) as part of the Vision for Space Exploration. The CEV was partly a reaction to the Space Shuttle Columbia accident, the subsequent findings and report by the Columbia Accident Investigation Board (CAIB), and the White House's review of the American space program. The CEV effectively replaced the conceptual Orbital Space Plane (OSP), which was proposed after the cancellation of the Lockheed Martin X-33 program to produce a replacement for the Space Shuttle. As the Vision for Space Exploration was developed into the Constellation program under NASA administrator Sean O'Keefe, the Crew Exploration Vehicle was renamed the Orion Crew Exploration Vehicle, after the stellar constellation of the same name. Constellation proposed using the Orion CEV in both crew and cargo variants to support the International Space Station and as a crew vehicle for a return to the Moon. The Apollo-like design included a service module for life support and propulsion and the crew/command module was originally intended to land on solid ground on the US west coast using airbags, but later changed to ocean splashdown. The Orion CEV weighs about 23 tonnes, less than the 30 tonne Apollo command and service module. The crew module would weigh about 8.9 tonnes, greater than the equivalent Apollo command module at 5.8 tonnes. With a diameter of 5 metres as opposed to 3.9 metres, the Orion CEV would provide 2.5 times greater volume as compared to the Apollo CM. The service module was originally planned to use liquid methane (LCH4) as its fuel, but switched to hypergolic propellants due to the infancy of oxygen/methane-powered rocket technologies and the goal of launching the Orion CEV by 2012. The Orion CEV design consisted of two main parts: a conical crew module (CM) and a cylindrical service module (SM) holding the spacecraft's propulsion system and expendable supplies. Both were based substantially on the Apollo command and service modules flown between 1967 and 1975. The Orion CEV was to be launched on the Ares I rocket to low Earth orbit, where it would rendezvous with the Altair lunar surface access module (LSAM) launched on a heavy-lift Ares V launch vehicle for lunar missions. 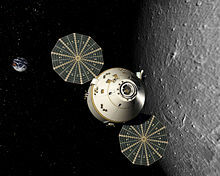 Artist's conception of the Orion spacecraft as then designed in lunar orbit. On May 7, 2009, the Obama administration enlisted the Augustine Commission to perform a full independent review of the ongoing NASA space exploration program. The commission found the then current Constellation Program to be woefully under-budgeted, behind schedule by four years or more in several essential components, with significant cost overruns, and unlikely to be capable of meeting any of its scheduled goals under its current budget. As a consequence, the commission recommended a significant re-allocation of goals and resources. As one of the many outcomes based on these recommendations, on October 11, 2010, the Constellation program was cancelled, ending development of the Altair, Ares I, and Ares V. The Orion Crew Exploration Vehicle survived the cancellation and was renamed the Multi-Purpose Crew Vehicle (MPCV), to be launched on the Space Launch System. Through the program restructuring from Constellation to Post Constellation, the Orion development program moved from the development of three different versions of the Orion capsule, each for a different task, to the development of a single version capable of performing multiple tasks. On October 30, 2014, the somewhat redesigned Multi-Purpose spacecraft completed its first flight readiness review (FRR), allowing the vehicle to be integrated with the Delta IV rocket and readied for launch. On December 5, 2014 it was successfully launched into space and retrieved at sea after splashdown on the Exploration Flight Test 1 (EFT-1), marking NASA's re-entry into the business of designing and producing new crewed spacecraft. Artist's concept of an astronaut on an EVA taking samples from a captured asteroid; Orion in the background. This mission would have placed an asteroid in lunar orbit, rather than sending astronauts to an asteroid in deep space. It was a part of the FY2014 budget request. Originally planned for 2017, then 2020, and then for December 2021, the mission was given its notice of defunding in April 2017. The launch vehicle would have been either a Delta IV Heavy, SLS or Falcon Heavy. The boulder would have arrived in lunar orbit by late 2025, where it was to be further analyzed both by robotic probes and by a future crewed mission called ARCM (Asteroid Redirect Crewed Mission). The development of advanced solar electric propulsion technology originally meant for this mission continues for its potential application on the proposed Lunar Orbital Platform-Gateway. 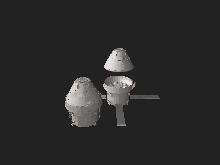 Interactive 3D models of Orion, with the spacecraft fully integrated on the left and in exploded view on the right. The Orion MPCV takes basic design elements from the Apollo command module that took astronauts to the Moon, but its technology and capability are more advanced. It is designed to support long-duration deep space missions, with up to 21 days active crew time plus 6 months quiescent. During the quiescent period crew life support would be provided by another module such as a Deep Space Habitat. The spacecraft's life support, propulsion, thermal protection, and avionics systems are designed to be upgradeable as new technologies become available. The MPCV spacecraft includes both crew and service modules, and a spacecraft adaptor. The MPCV's crew module is larger than Apollo's and can support more crew members for short or long-duration missions. The service module fuels and propels the spacecraft as well as storing oxygen and water for astronauts. The service module's structure is also being designed to provide locations to mount scientific experiments and cargo. Interior of the Orion mock-up in October 2014. Testing of Orion's parachute system. The Orion crew module (CM) is the reusable transportation capsule that provides a habitat for the crew, provides storage for consumables and research instruments, and serves as the docking port for crew transfers. The crew module is the only part of the MPCV that returns to Earth after each mission and is a 57.5° frustum shape, similar to that of the Apollo command module. As projected, the CM will be 5.02 meters (16 ft 6 in) in diameter and 3.3 meters (10 ft 10 in) in length, with a mass of about 8.5 metric tons (19,000 lb). It was manufactured by the Lockheed Martin Corporation. It will have more than 50% more volume than the Apollo capsule, which had an interior volume of 5.9 m3 (210 cu ft), and will carry four to six astronauts. After extensive study, NASA has selected the Avcoat ablator system for the Orion crew module. Avcoat, which is composed of silica fibers with a resin in a honeycomb made of fiberglass and phenolic resin, was formerly used on the Apollo missions and on select areas of the space shuttle for early flights. "Glass cockpit" digital control systems derived from those of the Boeing 787 Dreamliner. An "autodock" feature, like those of Russian Progress spacecraft, the European Automated Transfer Vehicle, and the SpaceX Dragon 2, with provision for the flight crew to take over in an emergency. Prior American spacecraft (Gemini, Apollo, and Space Shuttle) have all needed manual piloting for docking. Improved waste-management facilities, with a miniature camping-style toilet and the unisex "relief tube" used on the space shuttle (whose system was based on that used on Skylab) and the International Space Station (based on the Soyuz, Salyut, and Mir systems). This eliminates the use of the much-hated plastic "Apollo bags" used by the Apollo crews. 2) mixed atmosphere at either sea level (101.3 kPa or 14.69 psi) or reduced (55.2 to 70.3 kPa or 8.01 to 10.20 psi) pressure. Far more advanced computers than on prior crew vehicles. The CM will be built of the aluminium-lithium alloy used on the Space Shuttle external tank, and the Delta IV and Atlas V rockets. The CM will be covered in the same Nomex felt-like thermal protection blankets used on parts on the shuttle not subject to critical heating, such as the payload bay doors. The reusable recovery parachutes will be based on the parachutes used on both the Apollo spacecraft and the Space Shuttle Solid Rocket Boosters, and will also use Nomex cloth for construction. Water landings will be the exclusive means of recovery for the Orion CM. To allow Orion to mate with other vehicles, it will be equipped with the NASA Docking System, which is somewhat similar to the APAS-95 docking mechanism used on the Shuttle fleet. The spacecraft will employ a Launch Escape System (LES) like that used in Mercury and Apollo, along with an Apollo-derived "Boost Protective Cover" (made of fiberglass), to protect the Orion CM from aerodynamic and impact stresses during the first ​2 1⁄2 minutes of ascent. Its designers claim that the MPCV is designed to be 10 times safer during ascent and reentry than the Space Shuttle. The CM is designed to be refurbished and reused. In addition, all of the Orion's component parts have been designed to be as generic as possible, so that between the craft's first test flight in 2014 and its projected Mars voyage in the 2030s, the spacecraft can be upgraded as new technologies become available. In May 2011 the ESA director general announced a possible collaboration with NASA to work on a successor to the ATV (Automated Transfer Vehicle). On June 21, 2012, Airbus Defence and Space announced that they had been awarded two separate studies, each worth €6.5 million, to evaluate the possibilities of using technology and experience gained from ATV and Columbus related work for future missions. The first looked into the possible construction of a service module which would be used in tandem with the Orion capsule. The second examined the possible production of a versatile multi purpose orbital vehicle. On November 21, 2012, the ESA decided to develop an ATV-derived service module for the Orion MPCV. The service module is being manufactured by Airbus Defence and Space in Bremen, Germany. NASA announced on January 16, 2013 that the ESA service module will first fly on Exploration Mission 1, the debut launch of the Space Launch System. Testing of the European service module began in February 2016, at the Space Power Facility. On 16 February 2017 a €200m contract was signed between Airbus and the European Space Agency for the production of a second European service module for use on the first crewed Orion flight, called Exploration Mission-2 (EM-2). In the event of an emergency on the launch pad or during ascent, a launch escape system called the Launch Abort System (LAS) will separate the crew module from the launch vehicle using a solid rocket-powered launch abort motor (AM), which will produce more thrust (though for a much shorter duration) than the Atlas 109-D booster that launched astronaut John Glenn into orbit in 1962. There are two other propulsion systems in the LAS stack: the attitude control motor (ACM) and the jettison motor (JM). The ACM is a thruster system on the escape tower used to position and orient the capsule. The jettison motor is a solid rocket system used to separate the LAS from the crew capsule. On July 10, 2007, Orbital Sciences, the prime contractor for the LAS, awarded Alliant Techsystems (ATK) a $62.5 million sub-contract to, "design, develop, produce, test and deliver the launch abort motor." ATK, which had the prime contract for the first stage of the Ares I rocket, intended to use a "reverse flow" design for the motor. On July 9, 2008, NASA announced that ATK had completed a vertical test stand at a facility in Promontory, Utah to test launch abort motors for the Orion spacecraft. Another long-time space motor contractor, Aerojet, was awarded the jettison motor design and development contract for the LAS. As of September 2008, Aerojet has, along with team members Orbital Sciences, Lockheed Martin and NASA, successfully demonstrated two full-scale test firings of the jettison motor. This motor is important to every flight in that it functions to pull the LAS tower away from the vehicle after a successful launch. The motor also functions in the same manner for an abort scenario. Space Vehicle Mockup Facility (SVMF) in Johnson Space Center, includes a full-scale Orion capsule mock-up for astronaut training. Exploration Flight Test 1 (EFT-1) Orion (originally designated OFT-1), constructed at Michoud Assembly Facility, was delivered by Lockheed Martin to the Kennedy Space Center on July 2, 2012 and launched and recovered on December 5, 2014. The Boilerplate Test Article (BTA) underwent splashdown testing at the Hydro Impact Basin of NASA's Langley Research Center. This same test article has been modified to support Orion Recovery Testing in the Stationary and Underway recovery tests. The BTA contains over 150 sensors to gather data on its test drops. Testing of the 18,000 pound mockup ran from July 2011 to January 6, 2012. The Ground Test Article (GTA) stack, located at Lockheed Martin in Denver, is undergoing vibration testing. It is made up by the Orion Ground Test Vehicle (GTV) combined with its Launch Abort System (LAS). Further testing will see the addition of service module simulator panels and Thermal Protection System (TPS) to the GTA stack. The Drop Test Article (DTA), also known as the Drop Test Vehicle (DTV) is undergoing test drops at the US Army's Yuma Proving Ground in Arizona. The mock Orion parachute compartment is dropped from an altitude of 25,000 feet from a C-130. Testing began in 2007. Drogue chutes deploy around 20,000 and 15,000 feet. Testing of the reefing staged parachutes includes partial failure instances including partial opening and complete failure of one of the three main parachutes. With only two chutes deployed the DTA lands at 33 feet per second, the maximum touchdown speed for Orion's design. Other related test vehicles include the now-defunct Orion Parachute Test Vehicle (PTV) and its replacement the Generation II Parachute Test Vehicle (PTV2). The drop test program has had several failures in 2007, 2008, and 2010. The new PTV was successfully tested February 29, 2012 deploying from a C-17. Ten drag chutes will drag the mockup's pallet from the aircraft for the drop at 25,000 feet. The landing parachute set of eight is known as the Capsule Parachute Assembly System (CPAS). The test examined air flow disturbance behind the mimicked full size vehicle and its effects on the parachute system. The PTV landed on the desert floor at 17 mph (7.6 m/s). A third test vehicle, the PCDTV3, was successfully tested in a drop on April 17, 2012. "The test examined how Orion's wake, the disturbance of the air flow behind the vehicle, would affect the performance of the parachute system." NASA performed environmental testing of Orion from 2007 to 2011 at the Glenn Research Center Plum Brook Station in Sandusky, Ohio. The Center's Space Power Facility is the world's largest thermal vacuum chamber. On March 2, 2009, a full size, full weight command module mockup (pathfinder) began its journey from the Langley Research Center to the White Sands Missile Range, New Mexico, for at-gantry launch vehicle assembly training and for LAS testing. On May 10, 2010, NASA successfully executed the LAS PAD-Abort-1 test at White Sands New Mexico, launching a boilerplate (mock-up) Orion capsule to an altitude of approximately 6000 feet. The test used three solid-fuel rocket motors – a main thrust motor, an attitude control motor and the jettison motor. An improved Abort engine test was successfully completed on March 30, 2019. Future LAS test plans: As of April 2019[update], NASA plans to launch the Orion Multi Purpose Crew Vehicle Ascent Abort 2 test flight (AA‑2) from the Spaceport Florida Launch Complex 46 on June 12, 2019. Before the first test flight and recovery of the Orion space vehicle at sea in December 2014, several preparatory vehicle recovery tests were performed. In 2009 during the Constellation phase of the program, the Post-landing Orion Recovery Test (PORT) was designed to determine and evaluate methods of crew rescue and what kind of motions the astronaut crew could expect after landing. This would include conditions outside the capsule for the recovery team. The evaluation process supported NASA's design of landing recovery operations including equipment, ship and crew needs. The PORT Test used a full-scale boilerplate (mock-up) of NASA's Orion crew module and was tested in water under simulated and real weather conditions. Tests began March 23, 2009 with a Navy-built, 18,000-pound boilerplate when it was placed in a test pool at the Naval Surface Warfare Center's Carderock Division in West Bethesda, Md. Full sea testing ran April 6–30, 2009, at various locations off the coast of NASA's Kennedy Space Center with media coverage. Under the Orion program testing, Orion continued the "crawl, walk, run" approach used in PORT testing. The "crawl" phase was performed August 12–16, 2013 with the Stationary Recovery Test (SRT). The Stationary Recovery Test demonstrated the recovery hardware and techniques that were to be employed for the recovery of the Orion crew module in the protected waters of Naval Station Norfolk utilizing the USS Arlington as the recovery ship. The USS Arlington is a LPD 17 amphibious assault ship. The recovery of the Orion crew module will utilize unique features of the LPD 17 class ship to safely and economically recover the Orion crew module and eventually its astronaut crew. The "walk" and "run" phases were performed with the Underway Recovery Test (URT). Also utilizing the LPD 17 class ship, the URT were performed in more realistic sea conditions off the coast of California in early 2014 to prepare the US Navy / NASA team for recovering the Exploration Flight Test 1 (EFT-1) Orion crew module. The URT tests completed the pre-launch test phase of the Orion recovery system. At 7:05 AM EST on December 5, 2014 the Orion capsule was launched atop a Delta IV Heavy rocket for its first test flight, and splashed down in the Pacific Ocean about 4.5 hours later. Although it was not crewed, the two-orbit flight was NASA's first launch of a human-rated vehicle since the retirement of the Space Shuttle fleet in 2011. Orion reached an altitude of 3,600 mi (5,800 km) and speeds of up to 20,000 mph (8,900 m/s) on a flight that tested Orion's heat shield, parachutes, jettisoning components, and on-board computers. Orion was recovered by USS Anchorage and brought to San Diego, California for its return to Kennedy Space Center in Florida. Artist's concept of the Lunar Orbital Platform-Gateway orbiting the Moon. The Orion MPCV is docked on the left. The Lunar Orbital Platform-Gateway (LOP-G) is a proposed space station in lunar orbit intended to serve as an all-in-one solar-powered communications hub, science laboratory, short-term habitation module, and staging area for rovers and other robots. Various components of the Gateway would be launched on commercial launch vehicles and on the Space Launch System as Orion co-manifested payloads on the flights EM-3 through EM-9. Exploration Mission 2 EM-2 SLS Block 1B Crew 4 people Late 2022 Delegated to commercial launcher 16-26 days Lunar halo orbit Deliver Power and Propulsion Element (PPE) as the first module of the Lunar Orbital Platform-Gateway (LOP-G). Exploration Mission 6 EM-6 SLS Block 1B Crew 4 people 2024 Delegated to commercial launcher 26-42 days L2 Southern NRHO First logistics module supply mission and delivery of the robotic arm to LOP-G. The Orion capsule is designed to support future missions to send astronauts to Mars, probably to take place in the 2030s. Since the Orion capsule provides only about 2.25 m3 (79 cu ft) of living space per crew member, the use of an additional Deep Space Habitat module will be needed for long duration missions. The habitat module will provide additional space and supplies, as well as facilitate spacecraft maintenance, mission communications, exercise, training, and personal recreation. Some plans for DSH modules would provide approximately 70.0 m3 (2,472 cu ft) of living space per crew member, though the DSH module is currently only in its early planning stages. DSH sizes and configurations may vary slightly, depending on crew and mission needs. The mission is planned to launch in 2033. Orion ground test article in Colorado on May 13, 2011. EFT-1 Orion after final weld on June 22, 2012 at NASA's rocket factory. Orion MPCV ground test vehicle is lifted into the acoustic chamber. Orion ground test vehicle sits on a work stand in the Operations and Checkout O&C Facility. Completed EFT-1 Orion on September 8, 2014. First welds of the EM-2 Orion. ^ "NASA Authorization Act of 2010". Thomas.loc.gov. Retrieved November 20, 2010. ^ Bergin, Chris (July 10, 2012). "NASA ESD set key Orion requirement based on Lunar missions". NASASpaceFlight.com. Retrieved July 23, 2012. ^ Moskowitz, Clara (November 2014). "Deep Space or Bust". Scientific American. 311 (6): 20. Bibcode:2014SciAm.311f..20M. doi:10.1038/scientificamerican1214-20. ^ a b c "Orion Quick facts" (PDF). NASA. August 4, 2014. Retrieved October 29, 2015. ^ "Preliminary Report Regarding NASA's Space Launch System and Multi-Purpose Crew Vehicle" (PDF). NASA. January 2011. Retrieved May 25, 2011. ^ Bergin, Chris. "EFT-1 Orion completes assembly and conducts FRR". NASASpaceflight.com. Retrieved November 10, 2014. ^ "NASA - A 21st Century-Style Return to the Moon". www.nasa.gov. ^ a b Wall, Mike (May 24, 2011). "NASA Unveils New Spaceship for Deep Space Exploration". Space.com. Retrieved May 24, 2011. ^ Moen, Marina M. "Feasibility of Orion Crew Module Entry on Half of Available Propellant Due to Tank Isolation Fault". American Institute of Aeronautics and Astronautics. NASA Langley Research Center. Retrieved September 15, 2011. ^ "Michoud Assembly Facility Lockheed Martin Webpage". NASA. Retrieved November 27, 2018. ^ a b c "NASA Signs Agreement for a European-Provided Orion Service Module". nasa.gov. January 16, 2013. Archived from the original on March 28, 2014. Retrieved March 28, 2014. ^ "ESA workhorse to power NASA's Orion spacecraft / Research / Human Spaceflight / Our Activities / ESA". Esa.int. 2013-01-16. Retrieved 2014-07-15. ^ Bergin, Chris (March 15, 2014). "EFT-1 Orion slips to December – Allows military satellite to launch first". nasaspaceflight.com. NASAspaceflight.com. Archived from the original on March 28, 2014. Retrieved March 28, 2014. ^ Clark, Stephen (March 15, 2014). "Launch schedule shakeup delays Orion to December". spaceflightnow.com. Archived from the original on March 28, 2014. Retrieved March 28, 2014. ^ "Orion Exploration Flight Test-1". aerospaceguide.net. January 11, 2014. Archived from the original on March 28, 2014. Retrieved March 28, 2014. ^ Fountain, Henry (December 5, 2014). "NASA's Orion Spacecraft Splashes Down in Pacific After Test Flight". New York Times. Retrieved December 5, 2014. ^ "Orion Post-Scrub News Conference". 5 December 2014. ^ a b J. Foust (September 16, 2015). "First Crewed Orion Mission May Slip to 2023". Space News. Retrieved September 16, 2015. ^ Berger, Eric (28 July 2016). "A new, independent review of the Orion spacecraft is pretty damning". Ars Technica. Retrieved 28 July 2016. ^ "NASA New Start Inflation Indices". National Aeronautics and Space Administration. Retrieved June 7, 2016. ^ "FY 2008 Budget Estimates" (PDF). National Aeronautics and Space Administration. p. ESMD-25. Retrieved June 7, 2016. ^ "Fiscal Year 2009 Budget Estimates" (PDF). National Aeronautics and space Administration. p. iv. Retrieved June 7, 2016. ^ a b c "Fiscal Year 2010 Budget Estimates" (PDF). National Aeronautics and Space Administration. p. v. Retrieved June 7, 2016. ^ "FY 2013 President's Budget Request Summary" (PDF). National Aeronautics and Space Administration. p. BUD-4. Retrieved June 7, 2016. ^ "FY 2014 President's Budget Request Summary" (PDF). National Aeronautics and Space Administration. p. BUD-8. Retrieved June 7, 2016. ^ "FY 2015 President's Budget Request Summary" (PDF). National Aeronautics and Space Administration. p. BUD-5. Retrieved June 7, 2016. ^ "FY 2016 President's Budget Request Summary" (PDF). National Aeronautics and space Administration. p. BUD-5. Retrieved June 7, 2016. ^ "FY 2017 Budget Estimates" (PDF). nasa.gov. National Aeronautics and Space Administration. p. BUD-4. Retrieved January 1, 2019. ^ "FY 2018 Budget Estimates" (PDF). nasa.gov. National Aeronautics and Space Administration. p. BUD-3. Retrieved January 1, 2019. ^ "Public Law 115-31, 115th Congress" (PDF). congress.gov. p. 213. ^ "2018 Consolidated Appropriations Act" (PDF). congress.gov. p. 82. ^ "NASA Actions Needed to Improve Transparency and Assess Long Term Affordability of Human Exploration Programs" (PDF). General Accounting Office. May 2014. p. 2. Retrieved June 7, 2016. ^ Smith, Marcia (January 17, 2013). "NASA-ESA Agreement on Orion Service Module is For Only One Unit Plus Spares". spacepolicyonline.com. Retrieved June 28, 2016. ^ Clark, Stephen (December 3, 2014). "ESA member states commit funding for Orion service module". spaceflightnow.com. Retrieved June 28, 2016. ^ "NASA's Ground Systems Development and Operations Program Completes Preliminary Design Review". National Aeronautics and Space Administration. Retrieved June 28, 2016. ^ "FY 2016 President's Budget Request Summary" (PDF). National Aeronautics and Space Administration. p. BUD-5. Retrieved June 28, 2016. ^ "FY 2019 Budget Estimates" (PDF). nasa.gov. National Aeronautics and Space Administration. p. BUD-2. Retrieved January 1, 2019. ^ Clark, Stephen (September 16, 2015). "Orion spacecraft may not fly with astronauts until 2023". spaceflightnow.com. Retrieved June 7, 2016. ^ Smith, Marcia (May 1, 2014). "Mikulski "Deeply Troubled" by NASA's Budget Request; SLS Won't Use 70 Percent JCL". spacepolicyonline.com. Retrieved June 7, 2016. ^ Berger, Eric (August 19, 2016). "How much will SLS and Orion cost to fly? Finally some answers". arstechnica.com. Retrieved January 1, 2019. ^ Berger, Eric (October 20, 2017). "NASA chooses not to tell Congress how much deep space missions cost". arstechnica.com. Retrieved January 1, 2019. ^ "President Bush Announces New Vision for Space Exploration Program" (Press release). White House Office of the Press Secretary. January 14, 2004. Retrieved September 1, 2006. ^ "Orion Spacecraft – Nasa Orion Spacecraft". aerospaceguide.net. ^ a b "Orion landings to be splashdowns – KSC buildings to be demolished". NASA SpaceFlight.com. August 5, 2007. Retrieved August 5, 2007. ^ "NASA Names New Crew Exploration Vehicle Orion" (Press release). NASA. August 22, 2006. Retrieved April 17, 2010. ^ Handlin, Daniel; Bergin, Chris (October 11, 2006). "NASA sets Orion 13 for Moon Return". NASAspaceflight.com. Retrieved March 3, 2007. ^ Handlin, Daniel; Bergin, Chris (July 22, 2006). "NASA makes major design changes to CEV". NASAspaceflight.com. Retrieved March 3, 2007. ^ "NASA Names Orion Contractor". NASA. August 31, 2006. Retrieved September 5, 2006. ^ "Today – President Signs NASA 2010 Authorization Act". Universetoday.com. Retrieved November 20, 2010. ^ "Orion Spacecraft Complete". NASA. October 30, 2014. Retrieved October 30, 2014. ^ Fountain, Henry (5 December 2014). "NASA's Orion Spacecraft Splashes Down in Pacific After Test Flight". The New York Times. Retrieved 5 December 2014. ^ a b United States House of Representatives Committee on Science, Space and Technology, Subcommittee on Space, Next Steps in Human Exploration to Mars and Beyond, May 21, 2013. ^ "NASA Announces Next Steps on Journey to Mars: Progress on Asteroid Initiative". NASA. March 25, 2015. Retrieved March 25, 2015. ^ a b Foust, Jeff (March 27, 2015). "NASA's Choice for Asteroid Redirect Mission May Not Sway Skeptics". Space News. Washington DC. Retrieved 2015-03-28. ^ Foust, Jeff (March 3, 2016). "NASA slips schedule of Asteroid Redirect Mission". SpaceNews. Retrieved March 6, 2016. ^ a b Jeff Foust (June 14, 2017). "NASA closing out Asteroid Redirect Mission". Space News. Retrieved September 9, 2017. ^ Gates, Michele (July 28, 2015). "Asteroid Redirect Mission Update" (PDF). NASA. Retrieved 2015-09-06. ^ a b Wall, Mike (April 10, 2013). "Inside NASA's Plan to Catch an Asteroid (Bruce Willis Not Required)". Space.com. TechMediaNetwork. Retrieved April 10, 2013. Cite error: Invalid <ref> tag; name "wall-2013" defined multiple times with different content (see the help page). ^ Peterson, L. (2009). "Environmental Control and Life Support System (ECLSS)" (PDF). ntrs.nasa.gov. Ames Research Center: NASA. Archived from the original on April 7, 2014. Retrieved April 7, 2014. 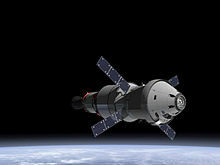 ^ a b "NASA Goes 'Green': Next Spacecraft to be Reusable – Orion Capsule". Space.com. ^ "NASA – Orion Crew Exploration Vehicle" (PDF) (Press release). NASA. February 7, 2009. Retrieved February 7, 2009. 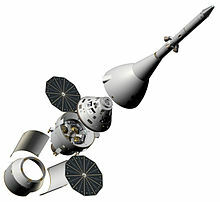 ^ "Lockheed to build Nasa 'Moonship'". BBC News. August 31, 2006. Retrieved March 1, 2007. ^ "NASA Names New Crew Exploration Vehicle Orion" (Press release). NASA. August 22, 2006. Retrieved March 3, 2007. ^ "NASA Selects Material for Orion Spacecraft Heat Shield" (Press release). NASA Ames Research Center. April 7, 2009. Retrieved April 16, 2009. ^ Coppinger, Rob (October 6, 2006). "NASA Orion crew vehicle will use voice controls in Boeing 787-style Honeywell smart cockpit". Flight International. Retrieved October 6, 2006. ^ "NASA Denies Making Orion Water Landing Decision – and Deleting Touchdowns on Land". NASA Watch. August 6, 2007. Retrieved November 23, 2010. ^ "NASA Announces Key Decision For Next Deep Space Transportation System". NASA. May 24, 2011. Retrieved May 25, 2011. ^ "US and Europe plan new spaceship". BBC News. May 5, 2011. Archived from the original on May 6, 2011. Retrieved 2011-05-14. ^ "ATV evolution studies look at exploration, debris removal". Spaceflight Now. June 21, 2012. Retrieved 2012-06-23. ^ "Airbus Defence and Space awarded two ATV evolution studies from ESA". Astrium. June 21, 2012. Archived from the original on April 3, 2013. Retrieved June 23, 2012. ^ Bergin, Chris (November 21, 2012). "UK steps up, as ESA commit to ATV Service Module on NASA's Orion". NASASpaceFlight.com. Retrieved 2014-07-15. ^ "Multi Purpose Crew Vehicle – European Service Module for NASA's Orion programme". Airbus Defense and Space. Retrieved 7 March 2016. ^ Cody Zoller (1 December 2015). "NASA to begin testing Orion's European Service Module". NASA SpaceFlight. Retrieved 7 March 2016. ^ Airbus Defence and Space wins 200 million euros ESA contract for second service module for NASA’s Orion crewed space capsule. Airbus Defense and Space press release. 16 February 2017. ^ "Mission to the Moon: How We'll Go Back – and Stay This Time". popularmechanics.com. Archived from the original on February 3, 2008. Retrieved February 8, 2008. ^ Mika McKinnon (mika.mckinnon@gmail.com) (2014-12-04). "Meet Orion, NASA's New Deep Space Explorer". Space.io9.com. Retrieved 2016-10-31. ^ "Launch Abort System Jettison Motor | Aerojet Rocketdyne". Rocket.com. Retrieved 2016-10-31. ^ "ATK Awarded Contract for Orion Launch Abort Motors". PRNewswire. Archived from the original on March 1, 2012. ^ "Orion's New Launch Abort Motor Test Stand Ready for Action". NASA. ^ "NASA Extreme Makeover—Space Vehicle Mockup Facility". nasa.gov. Retrieved 2014-12-05. ^ Bergin, Chris (October 9, 2011). "NASA managers "serious" about ATV role as Orion Service Module". nasaspaceflight.com. NASAspaceflight.com. Archived from the original on March 28, 2014. Retrieved March 28, 2014. ^ "What Goes Up Must Come Down As Orion Crew Vehicle Development Continues". Space-travel.com. Retrieved 2014-07-15. ^ "Orion Continues to Make a Splash". Space-travel.com. Retrieved 2014-07-15. ^ "Orion Drop Test – Jan. 06, 2012". Space-travel.com. Retrieved 2014-07-15. ^ Bergin, Chris (November 6, 2011). "NASA managers approve EFT-1 flight as Orion pushes for orbital debut". NASASpaceFlight.com. Retrieved 2014-07-15. ^ a b Bergin, Chris (October 17, 2011). "Space-bound Orion taking shape – "Lunar Surface First" missions referenced". NASASpaceFlight.com. Retrieved 2014-07-15. ^ "NASA Conducts Orion Parachute Testing for Orbital Test Flight". Space-travel.com. Retrieved 2014-07-15. ^ Bergin, Chris (February 10, 2012). "Orion hoping for success with second generation parachute system". NASASpaceFlight.com. Retrieved 2014-07-15. ^ Bergin, Chris (February 26, 2012). "Orion PTV preparing for drop test on Wednesday – EFT-1 Orion progress". NASASpaceFlight.com. Retrieved 2014-07-15. ^ "NASA Conducts New Parachute Test for Orion". Space-travel.com. Retrieved 2014-07-15. ^ "Orion parachutes preparing for another milestone drop test on April 17 | NASASpaceFlight.com". www.nasaspaceflight.com. Retrieved 2015-08-26. ^ "NASA Glenn To Test Orion Crew Exploration Vehicle". SpaceDaily. ^ "NASA: Constellation Abort Test November 2008". Nasa.gov. December 11, 2008. Retrieved November 20, 2010. ^ "NASA Orion LAS Pathfinder". Nasa.gov. Retrieved November 20, 2010. ^ "NASA Completes Test of Orion Crew Capsule". foxnews.com. May 6, 2010. Retrieved April 6, 2013. ^ "Year to abort: NASA preps Orion capsule for 2019 Ascent Abort-2 test". 27 April 2018. Retrieved 23 July 2018. ^ Messier, Doug (2014-02-11). "ATK to Upgrade Space Florida's Launch Complex 46". Parabolic Arc. Retrieved 2014-02-12. ^ "NASA Orion PORT Test". Nasa.gov. March 25, 2009. Retrieved November 20, 2010. ^ "NASA & US Navy Test Demonstrates Water Recovery of Orion Crew Capsule". Universetoday.com. Retrieved 2014-07-15. ^ "NASA's New Orion Spacecraft Completes First Spaceflight Test". NASA.gov. Retrieved December 9, 2014. ^ "Orion Off-loaded for Trip Back to Florida". NASA.gov. Retrieved December 9, 2014. ^ "NASA Won't Fly Astronauts On 1st Orion-SLS Test Flight Around the Moon". ^ Jackson, Shanessa (11 September 2018). "Competition Seeks University Concepts for Gateway and Deep Space Exploration Capabilities". nasa.gov. NASA. Retrieved 19 September 2018. ^ Godwin, Curt (April 1, 2017). "NASA's human spaceflight plans come into focus with announcement of Deep Space Gateway". Spaceflight Insider. Retrieved 2017-04-02. ^ a b Clark, Stephen (20 November 2017). "NASA expects first Space Launch System flight to slip into 2020". Spaceflight Now. Retrieved 24 May 2018. ^ a b Hambleton, Kathryn. "Exploration Mission-1 Map". nasa.gov. NASA. Retrieved 16 September 2018. ^ "NASA Completes Key Review of World's Most Powerful Rocket in Support". NASA. Retrieved 26 October 2015. ^ "Acronyms to Ascent – SLS managers create development milestone roadmap". Retrieved 26 October 2015. ^ "NASA's Space Launch System to Boost Science with Secondary Payloads". NASA's Marshall Center. April 2, 2015 – via YouTube. ^ "Near Earth Asteroid Scout (NEAScout)". JPL | Cubesat. ^ a b c d e f g Gebhardt, Chris (22 September 2017). "SLS EM-1 & -2 launch dates realign; EM-3 gains notional mission outline". NASASpaceFlight.com. Retrieved 23 September 2017. ^ a b Hambleton, Kathryn. "NASA's First Flight With Crew Important Step on Long-term Return to the Moon, Missions to Mars". nasa.gov. NASA. Retrieved 16 September 2018. ^ Daines, Gary (December 1, 2016). "First Flight With Crew Will Mark Important Step on Journey to Mars". Nasa.gov. Retrieved 2 January 2018. ^ Smith, Marcia (March 28, 2017). "NASA Continues Journey to Mars Planning". Space Policy Online. Retrieved June 7, 2018. ^ a b Foust, Jeff (10 March 2017). "NASA moving ahead with plans for cislunar human outpost". SpaceNews. Pocket Ventures, LLC. Archived from the original on 11 March 2017. Retrieved 11 March 2017. ^ Sloss, Philip (December 4, 2017). "NASA evaluates EM-2 launch options for Lunar Orbital Platform - Gateway PPE". NASASpaceFlight.com. Retrieved 2017-12-08. ^ a b c d Cite error: The named reference nsf-20180911 was invoked but never defined (see the help page). ^ a b c d e f g h i j k l m Gebhardt, Chris (April 6, 2017). "NASA finally sets goals, missions for SLS – eyes multi-step plan to Mars". NASASpaceFlight.com. Retrieved August 21, 2017. ^ Foust, Jeff (March 25, 2015). "NASA Selects Boulder Option for Asteroid Redirect Mission". Space News. Retrieved 2015-03-27. ^ Warner, Cheryl (23 October 2018). "NASA Seeks Information for Gateway Cargo Delivery Services". nasa.gov. NASA. Retrieved 27 October 2018. ^ "Preliminary Report Regarding NASA's Space Launch System and Multi-Purpose Crew Vehicle" (PDF). NASA. January 2011. Retrieved June 18, 2011. Wikimedia Commons has media related to Orion (spacecraft).